Bhagvan Padmaprabh dev was born in Kaushambi, on twelfth day of the dark half of the month of Kartik. His father name was King Dhar and Mother name was Susima. After long span of life time, he took diksha on 13th day of the dark half of the month of Kartik along with 1000 other men's. After 6 months of diksha and worldly life abandonment Lord Padmaprabh attained (kevalgyan) salvation on the full moon day (15th day) of the month of Chaitra and constellation of Chitra . On the eleventh day of the dark half of the month of Margshirsh, Bhagwan Padmaprabh, along with other 308 saints was liberated and attained nirvana on Sammet Shikhar (mountain). 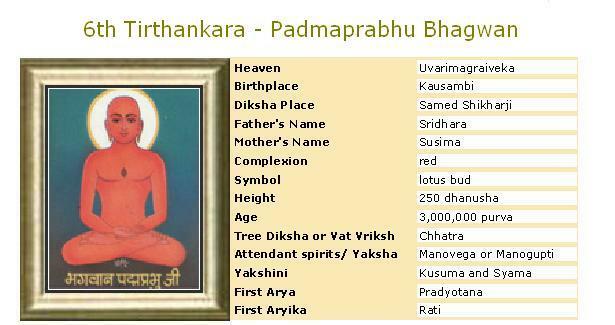 Bhagwan Padmaprabh lived for 30 lakh purv of which he spent 13 purvarg less of one lakh purv as an ascetics and 6 months of Meditation and Spiritual Practices (sahdana/tap). It is believed that Padmaprabh prabhu was 250 measure of bow (at that time unit of measurement was bow i.e. bow of bow & arrow) in height. Maharaj Aparajit ruled over Susima town in the Purvavideh area. He was a simple and religious person. He got detached after listening to the discourse of an Arhat and took Diksha from Acharya Pihitashrava. As a result of long spiritual practices he earned Trithankar-nama-gotra-karma. Completing his age, he reincarnated as a god in the Graiveyak dimension. From the dimension of gods, the being that was Aparajit descended into the womb of queen Susima, wife of the king Kaushambi. One day queen Susima had a desire to sleep on a bed made up of lotus flowers. As this was a desire of a pregnant mother, the gods made arrangements for its fulfillment. On the twelfth day of the dark half of the month of Kartik the queen gave birth to a son. The new born had a soft pink glow like lotus flowers. The king named him as Padmaprabh. In due course the prince became young and was married. When his father left for spiritual practices, Padmaprabh ascended the throne. After a long and successful reign, when through his threefold knowledge he knew that the right moment has come, he became an ascetic. After six months of spiritual practices, on the full moon day of the month of Chaitra he attained omniscience under a banyan tree. Propagating right religion for a long time, Bhagavan Padmaprabh wandered around and at last arrived at Sammetshikhar. He attained Nirvana on the eleventh day of the dark half of the month of Margshirsh.